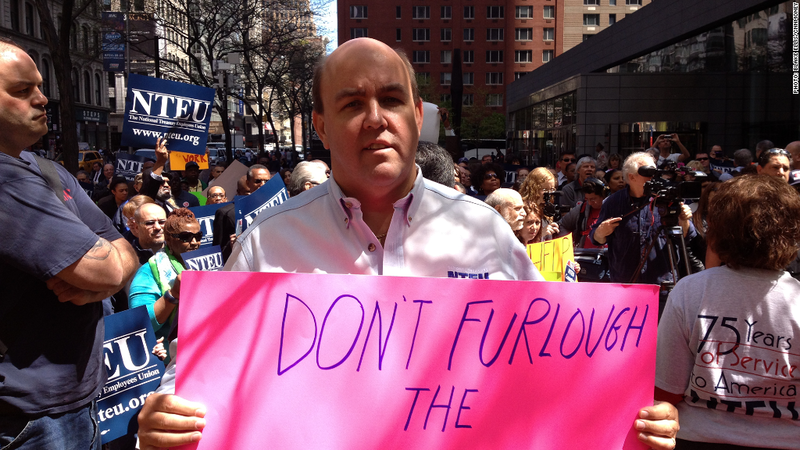 IRS workers gathered in New York City in May to protest the furloughs. Instead of being forced to take an unpaid furlough day, IRS employees will get paid next Monday after all, the IRS announced Tuesday. The agency said in May that workers would be furloughed without pay for five days as a result of government spending cuts aimed at wiping $600 million from the agency's budget this year. Next Monday, July 22, was scheduled to be the fourth furlough day, but the IRS said Tuesday that it is cutting costs elsewhere and therefore the day has been canceled -- meaning the agency will be open for business and all employees will be paid. Because of the short notice, unscheduled leave will be permitted on Monday for employees who already had plans. "This step follows a lot of hard work across the Service to cut costs," Danny Werfel, the IRS's Principal Deputy Commissioner, said in an e-mail to IRS employees. The fifth and final furlough day is Aug. 30, and Werfel said he will keep employees informed about whether this will remain the case. IRS workers: Stop the spending cuts! The National Treasury Employees Union, which has been protesting the spending cuts and furloughs, welcomed the cancellation of Monday's furlough. "While I am concerned that this announcement comes so close to the planned furlough day, it is a positive development arising from our continuing discussions with the agency," said NTEU President Colleen Kelley. Not so welcome is the news that as part of its cost-cutting efforts, the IRS intends to get rid of bonuses this year to help it "maintain taxpayer-facing operations during an unprecedented budget situation."